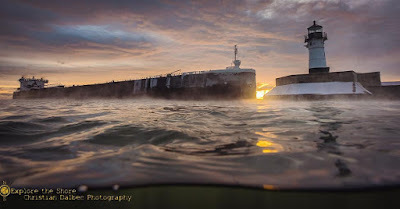 My friend Christian Dalbec from Two Harbors couldn't help himself for enjoying a morning swim (with a wetsuit) to photograph the arrival of the American Century in 0 deg weather. Very cool shot!!! Pun intended!!! We have given and received several photos of Mr. Dalbec's as gifts. There's hardly a shot that doesn't stop you and say "Wow!". His work takes some amazing angles and great advantage of the natural light. One guest at our home said, "Wow, either this guy's nuts -- or a genius!" My wife and I definitly think it's the latter.